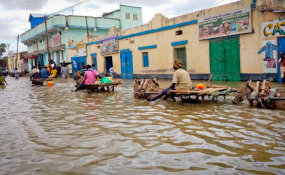 The National Emergency Management Agency (NEMA) has declared a 'national disaster' after many people died in severe floods across the country. Some state governments have complained of lack of capacity to handle the current situation, and have requested for prompt assistance as the flood continues the prowl. "On behalf of the President & Commander-in-Chief of the Armed Forces of the Federal Republic of Nigeria, @MBuhari, I, Engr. Mustapha Maihaja, Director-General of @nemanigeria, hereby declare National Disaster in the following States: Kogi, Niger, Anambra, Delta." That was the distress message from the NEMA Director General, Engr. Mustapha Maihaja, announcing emergency situation in four states after thousands of people were displaced following several weeks of heavy rainfall in some states. This followed the bursting of banks of Nigeria's two major rivers, Niger and Benue, killing many people and sweeping away homes. NEMA and the Nigeria Hydrological Services Agency (NIHSA) previously warned of heavy floods in states along the banks of Rivers Niger and Benue, asking residents of communities in Kebbi, Niger, Kwara, Edo, Kogi, Anambra, Rivers, Bayelsa and Delta from the River Niger axis and Taraba, Benue and Adamawa from the River Benue axis to prepare for a similarity of the 2012 flood. The agency warned of a worse situation as water levels continued to rise in several areas, especially Lokoja, which is at the confluence of the two rivers and often badly affected during such situations. NEMA spokesman, Sani Datti told CNN that five emergency operation centers had been created to coordinate search and rescue operations, while also providing humanitarian support for those displaced by the floods. He also said President Muhammadu Buhari had approved $8.2 million for procurement of medical and relief materials to help victims. Reports from across the states however reveal a desperate situation. Governor Abubakar Bello described the situation as a national crisis which is beyond the capacity of his government, after the Director General of the State Emergency Management Agency (NSEMA) confirmed that about 40 lives had been lost to flood this year with property valued at millions of naira including farmlands already destroyed. Six communities were submerged in Shiroro LGA. The affected communities include Gungu, Ungawar-Bagudu-Alhaji Umoru, Rafin Gora, Sani-Farin Mutum, Mashigi-Gungu, Ungwar Aboki. The communities were already due for relocation because of the ongoing works on the Zungeru dam. The incident caused an immense humanitarian crisis with over 2,000 persons displaced. They are all temporarily sheltered at the Zungeru Primary School. The governor undertook an aerial tour of the flood-ravaged areas in Lapai LGA. Agency officials said over 60 communities across the 22 affected councils were underwater. As usual, the hard hit local government areas are those classified as "red" including Mokwa, Lapai, Lavun, Borgu and Shiroro. Among the hard hit, the situation in Lapai is said to be the worst with about 8, 000 people displaced. Experts warned that the situation is going the way of that of 2012 when 63 people died with 42, 000 displaced, while about 300, 000 were directly affected. In Kogi State, thousands of people are currently living in temporary shelters provided by the state government after being displaced. Checks by Daily Trust revealed that many have lost property, crops, farmlands and other valuables worth millions of naira. Over 200 communities across the nine flood-prone local government areas in the state have been submerged, thus displacing thousands of people. Apart from residential buildings, schools, offices, shops, markets and worship places among others have been affected. Hundreds of residents of Ganaja Village in Ajaokuta LGA have been rendered homeless. Besides, motorists and commuters in the axis have hectic time passing parts of the Ajaokuta-Lokoja dual carriageway. Many buildings on both sides of the highway have been submerged by water. Many travellers heading towards Benue, the eastern part of the country, Igala land and Ajaokuta were held in heavy traffic for many hours on Wednesday as the water level kept increasing. The situation provided avenue for young boys to make brisk business as they charged between N300 and N500 to push vehicles out of water. In Kogi/Kotonkarfe, a High Court Complex and other government offices were submerged. A victim at the Community Primary School IDP camp in Kotonkarfe, Idris Abdulmumuni, said he lost everything to the flood. A native of Akpaku Village in Kogi/Kotonkarfe LGA, appealed to the government for assistance. "I have one of the largest rice farms in Akpaku. The flood destroyed my farm. I have 10 hectares. I also lost my maize, potatoes and okra farms to the flood. I couldn't harvest anything. Since we were displaced and we came to this camp on September 7, we have been suffering," he said. Other victims who spoke in similar vein, lamenting the trauma and losses the flood disaster have brought upon them. The state government has cried out for assistance from the federal government and other organisations. The Commissioner for Environment and Natural Resources, Sanusi Yahaya, said the government needed assistance in the provision of relief materials such as food items, water, mattresses, drugs, mosquito nets and blankets. "We have challenges on where this large number of people will stay. There are thousands of displaced people who are living with relatives and friends, if you add all these, you are talking of thousands of people", he said. According to him, the government also needs assistance on psychosocial support for traumatized victims. He noted that the state government cannot meet up the challenge alone, given the magnitude of the disaster. According to him, over 25 camps have been opened across the state for those displaced. The commissioner said NEMA had supplied some relief materials to the state and distribution had since commenced. Items that have so far arrived include mattresses, blankets and mats. The commissioner appealed to individuals, corporate organisations and professional bodies to assist the victims, saying government could not do it alone, and urged residents who live on flood plains but are yet to relocate to do so urgently. The Bayelsa State government has been pressing the federal government to provide its own share of the N1.6 billion intervention fund which the National Economic Council approved after the 2012 flood disaster. The state's deputy governor, Rear Admiral Gborigbogha John Jonah (Rtd) disclosed this when he received a delegation from NEMA in Yenagoa. Already, the residents of Epie and Onopa creeks in Yenagoa LGA have continued to lament the impact of the flood. When Daily Trust visited the river side settlements on Wednesday, some residents said the water level had risen above safety limits. A resident at Onopa area, Mrs. Joy Elvis, said they were helpless because the assistance pledged by the state government in its sensitisation messages was not forthcoming. "It has not been easy, the water level has been on the increase and it is usually expected at this time of the year, but on Tuesday the flood entered our houses and we have been under pressure. We need help badly but no one seems to care, we have resorted to moving some of our valuable things to neighbours' houses because there no shelter is provided by government," she said. Another resident, John Abide, said they were compelled to use canoes to get to their homes as the water level continued to rise. Even Otuoke-Onuebum road in Ogbia LGA has been taken over by flood, as vehicles now ply alternative routes from Elebele Village, a distance to Otuoke, the home town of former president, Goodluck Jonathan, which is also home to a federal university. A worker at university, Clever Ogbodi, told journalists yesterday that passengers were paying an increased fare of N400 instead of the N250 normally paid from Otuoke to Yenagoa. He said: "This was how it happened in October 2012 when flood took over the whole community, but till now, there is no proper preventive measure." A resident of the community, Mrs. Azibator Omonibo, blamed the State Emergency Management Agency, (SEMA) and the government for not properly utilising the Flood Intervention Fund she supposed was given to the state in 2012. She is obviously not aware that the same government is complaining of non-availability of the fund till date.